O’Reilly Media delivered a better conference experience than in 2016 and again provided very high-quality content. 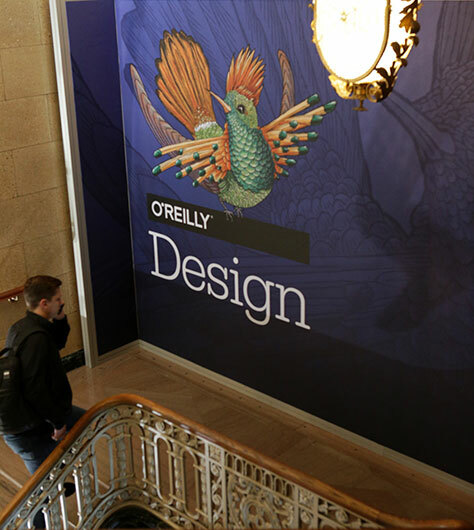 The overarching theme of the second annual O’Reilly Design Conference was “Prepare to Design the Future.” The conference convened March 20–22, 2017, at the historic Westin St. Francis Hotel, on Union Square in San Francisco. Monday, March 20, provided a full day of tutorials, while the main conference took place on March 21 and 22. O’Reilly Media delivered a better conference experience than in 2016 and again provided very high-quality content. The O’Reilly Design Conference 2017 was a well-organized event and was significantly better than the inaugural conference in 2016. 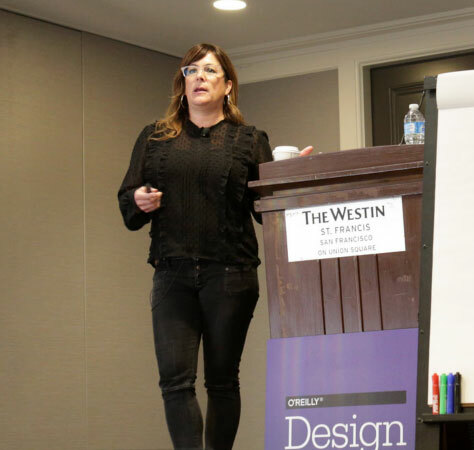 This year, Mary Treseler, Director of Strategic Content at O’Reilly Media shared her Program Chair duties with independent design consultant and author Leah Buley. They planned the conference with the help of a Program Committee that included 29 UX professionals. The one big disappointment for me was that the scheduled time for Jorge Arango’s “Architecture Walking Tour of San Francisco” on Monday was not in sync with the other events of the day, causing me to miss it. I had arranged a lunch meeting, and the tour began half an hour earlier than the afternoon tutorials. Mary Treseler and Leah Buley kicked off each morning of the main conference in the Grand Ballroom, as Figure 1 shows, welcoming conference attendees to a series of brief keynotes—with talks ranging from ten to twenty-five minutes in length, then concluding with a fireside chat. Thus, everyone shared the same conference experience until the morning break at 10:45am. The remainder of each day comprised four or five tracks of sessions at various hours of the day. Image source: O’Reilly Media, Inc.
On Tuesday, March 21, the day began with five keynoters—Kat Holmes, Director of Inclusive Design at Microsoft; Professor Barry Katz of Stanford and California College of the Arts; Dan Hill, Head of Arup Digital Studio; Julie Zhuo, VP, Product Design, at Facebook; and Doug Powell, Distinguished Designer at IBM—and a fireside chat with Irene Au and Ivy Ross. The sessions that took place throughout the remainder of the day included 20 presentations and three panel discussions. The morning of Wednesday, March 22, featured three keynotes—Alan Cooper, Cofounder of Cooper; Dan Mall, Founder and Executive Director of SuperFriendly; and Jennifer Pahlka, Founder and Executive Director of Code for America—and concluded with a fireside chat featuring John Allspaw and Randy Hunt. The remaining sessions that day included 19 presentations and one panel discussion. It was difficult for me to see how the organizers shoehorned some topics into certain themes. [There was] a lack of coherence in some themes. 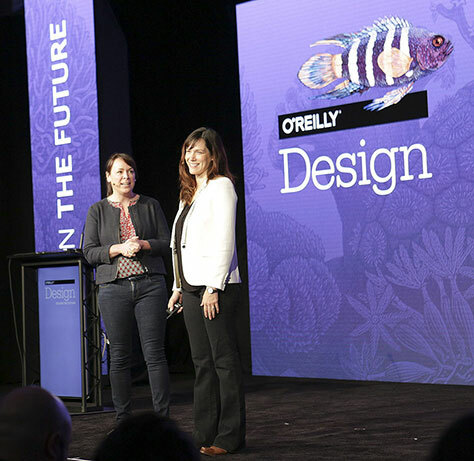 O’Reilly programmed this conference to reflect “the multidisciplinary nature of design” and appeal to UX professionals working in diverse design and research disciplines, as well as product managers, strategists, and entrepreneurs. In all honesty, it was difficult for me to see how the organizers shoehorned some topics into certain themes. The absence of any definitions for these themes on the conference Web site may have contributed to a lack of coherence in some themes. Note the coverage of technologies under three of these themes. Plus, there was a lack of balance across the themes. Later in this first part of our conference review, I’ll provide an overview of the tutorials that took place on Monday, March 20, then Krispian and I will review the tutorials we attended. 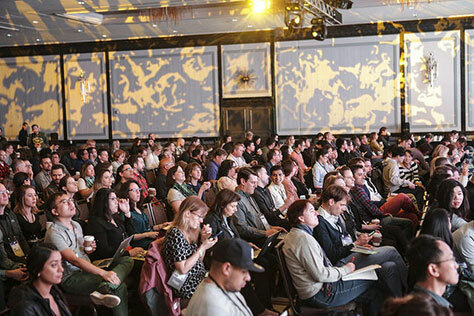 In Part 2 of our conference review, we’ll cover some of our favorite keynotes and sessions. O’Reilly has preserved an extraordinarily complete level of historical information about the conference on its Web site…. 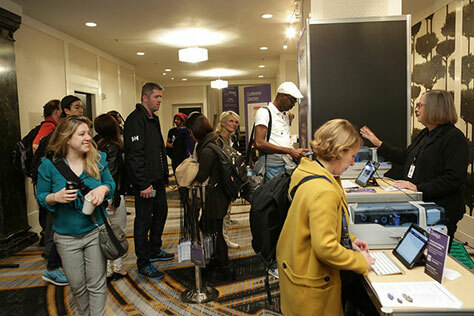 This year, O’Reilly provided comprehensive information about the O’Reilly Design Conference 2017 via a responsive Web site—including daily schedules for the tutorials, keynotes, sessions, and events; as well as detailed information about individual tutorials, sessions, speakers, and events. O’Reilly has preserved an extraordinarily complete level of historical information about the conference on its Web site, including speaker slides for many sessions—as well as videos of the keynotes—that the organizers added to the site after the conference. They’ve also provided links to video highlights on the conference site, some video clips on YouTube, and a collection of conference photos on flickr. Plus, on the home page of the O’Reilly Design Conference 2017 site, you’ll find a Video Compilation link to a collection of videos of all tutorials and conference sessions on Safari. To view these videos, you must have a Safari membership, but they offer a ten-day free trial that requires no credit card. The Westin St. Francis Hotel … provided an aesthetically pleasing environment that was much more conducive to both learning and socializing, as well as a much better dining experience. 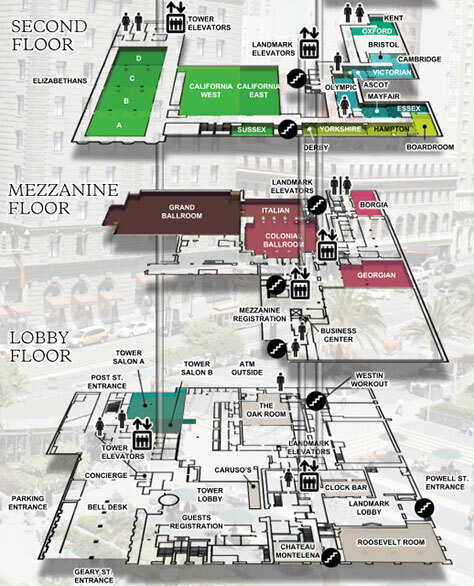 The Westin St. Francis Hotel, on Union Square in San Francisco, which is shown in Figure 2, was a huge improvement over the 2016 venue: the Fort Mason Center for Arts & Culture. This luxury hotel provided an aesthetically pleasing environment that was much more conducive to both learning and socializing, as well as a much better hotel and dining experience. The original two twelve-story wings of this Beaux-Arts hotel with 250 rooms opened in 1904; the modern, 32-story, 600-room Pacific Tower, in 1971. Beautiful, eye-catching O’Reilly Design Conference signage in the Landmark Lobby guided me up a flight of stairs with more colorful signage, shown in Figure 3, to the Registration desk on the Mezzanine, shown in Figure 4. The main deficiency of this venue was its poor navigability. Since the hotel was built in two stages and the two parts aren’t optimally integrated, it was somewhat difficult to get from sessions in the old part of the hotel to those in the new part. Plus, even though most of the sessions took place in rooms in the original hotel, those rooms were spread out across a couple of floors and laid out in a confusing manner, as shown in Figure 5. The Grand Ballroom, where each day began, was hidden behind the Italian room, which was packed with sponsor booths that completely blocked the view of its entrance. While the conference organizers did provide good signage, indicating the way to the various rooms, there weren’t always good lines of sight that would let one see any distance ahead. I wish I’d had this map of the venue during the conference. It provides a better representation of the venue than the map on the back of the single-sheet schedules attendees received daily. On Monday, the tutorials were held in the neighboring California East and California West, just up another flight from the Mezzanine, and in Tower Salon A. On Tuesday, while most of the session rooms—California East, California West, and the Olympic room—were arrayed around the Grand Ballroom where the keynotes took place, shown in Figure 6, others were in the distant Tower Salon A. On Wednesday, sessions again took place in the Grand Ballroom, California East, California West, and Tower Salon A, as well as in the Georgian room, which was near the Grand Ballroom. 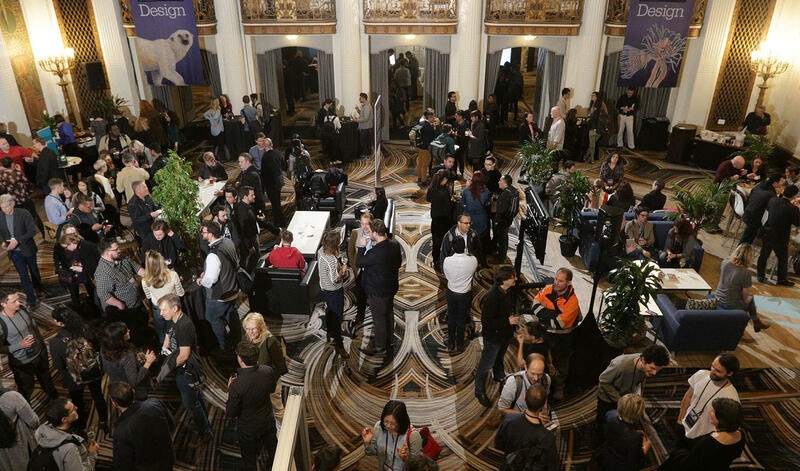 Even though the Grand Ballroom where the keynotes took place and California East and California West were in fairly close proximity to one another, the latter two rooms were up a flight of stairs. In most cases, the sizes of the rooms in which particular sessions occurred were well suited to the crowd size. When there was space, but not enough chairs, the hotel staff was great about bringing in more chairs to accommodate everyone. However, another issue was that there were very few places where people could sit down in the common spaces or the Sponsor Pavilion—in the Colonial and Italian rooms—where refreshments were usually served. I commuted into San Francisco daily for the conference, but would have loved to stay at the Westin St. Francis—an exceptionally fine conference hotel. 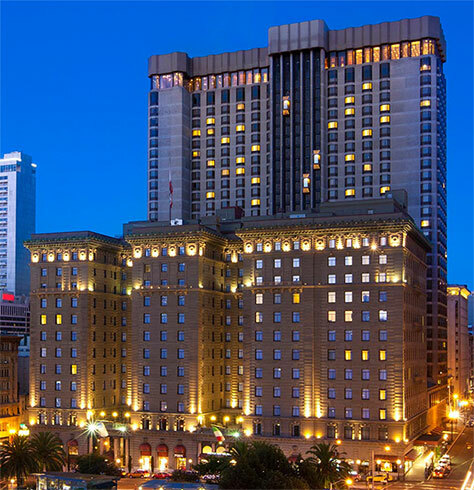 A key asset of the Westin St. Francis as a conference venue is its central, downtown location on Union Square, providing easy access to restaurants, nightclubs, shops, and public transportation—including the Powell Street cable car—that can get you anywhere in the city. Attendees could take glass-walled elevators up to the 32nd floor of the Tower, enjoying expansive views of downtown San Francisco on their way to the main hotel dining room, Alexandra’s, where floor-to-ceiling windows afforded stunning views of the skyline, bay, and bridges. On Monday, during morning and afternoon breaks from the tutorials, refreshments were served in the Mezzanine Foyer. During the main conference, on Tuesday and Wednesday, the day started at 7:30am, with coffee service in the Sponsor Pavilion, shown in Figure 7. At morning and afternoon breaks, refreshments were served in the Sponsor Pavilion. Each day, attendees gathered for a complimentary lunch. Dining rooms were set up in Elizabethan AB and Elizabethan CD on the second floor, adjacent to California East and California West sessions. Alternatively, attendees could take glass-walled elevators up to the 32nd floor of the Tower, enjoying expansive views of downtown San Francisco on their way to the main hotel dining room, Alexandra’s, shown in Figure 8, where floor-to-ceiling windows afforded stunning views of the skyline, bay, and bridges. I cannot comment on the quality of the food because, unlike most conferences, O’Reilly did not provide lunch for the media. Architecture Walking Tour of San Francisco—Information architect Jorge Arango guided this architectural tour of downtown San Francisco, describing how to apply wayfinding and context for architecture to designing information environments for digital products and services. He also discussed the elements that compose the city and the various forces that, over time, have shaped it. I was very sorry to miss it because of a scheduling conflict that afternoon. Opening Reception—At the end of the day, this reception took place in the Sponsor Pavilion where hors d’oeuvres and drinks were served. Figure 9 and the hero image at the beginning of this review show the crowd that gathered for the opening reception. Design Dash 5K Fun Run and Walk—This 5K run took place at a bright-and-early 6:30am, beginning at the St. Francis, going over to Market St. and taking it down to The Embarcadero, then taking a left to proceed to Washington St. The return leg back to the hotel covered Washington, Kearny, and Post Streets. Tuesday Speed Networking—Before the opening keynotes, attendees could gather for rapid-fire, 60-second conversations with fellow attendees. Tuesday O’Reilly Author Book Signings—During the morning and afternoon breaks, attendees lined up to meet O’Reilly authors—in the morning, Kristin Skinner, Peter Morville, and Jorge Arango; in the afternoon, Jim Kalbach, Cathy Pearl, Kathryn McElroy, and Richard Banfield—the first 25 getting a free, signed copy of a book. Figure 10 shows Cathy Pearl’s book signing. 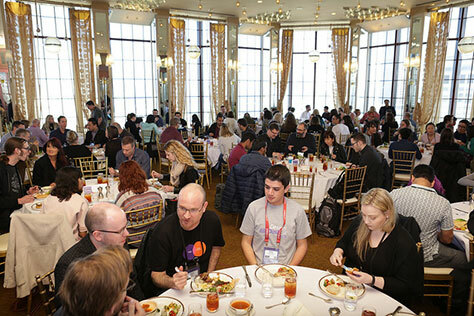 Tuesday Lunch and Birds-of-a-Feather (BOF) Sessions—Attendees with common interests shared lunch and ideas, discussing topics that included Design and Emerging Tech—VR, AR, AI and Machine Learning, and Robots—Hardware and the IoT, Voice Design, Data and Design, Enterprise UX, Chatbots, Diversity in Design, Design for Social Good, Design Startups, Design Education, Prototyping, User Research, Design and Business, Managing and Leading Designers, Women in Design, Design in the Public Sector, and Mentorship and Apprenticeship. Sponsor Pavilion Reception—Attendees gathered for drinks, socializing, and a chance to check out the sponsors’ wares. Design Dine-A-Round—O’Reilly made reservations at nine of San Francisco’s many great restaurants, where conference goers could meet up with one another for dinner. Nothing for vegans though. Wednesday Speed Networking—Some attendees came together before the opening keynotes for brief, 60-second conversations. 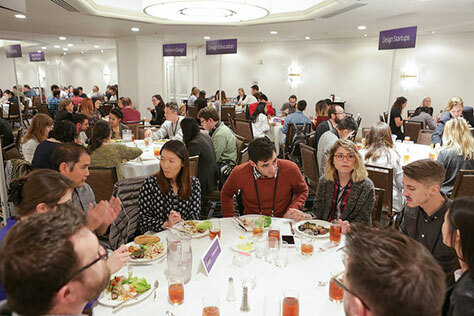 Wednesday Lunch and Birds-of-a-Feather (BOF) Sessions—Again, attendees with common interests gathered at lunch for round-table discussions, covering similar topics as on Tuesday. Figure 11 shows a BOF discussion. Wednesday O’Reilly Author Book Signings—Another round of book signings took place during the afternoon break on Wednesday. Attendees lined up to meet O’Reilly authors Tim Frick, Elizabeth Goodman, and Martin Charlier, in the hope of getting a free, signed copy of a book. For those of us who weren’t fortunate enough to get a free O’Reilly book, there was still some choice swag for conference-goers, including the booklet What Is the Internet of Things?, a print version of O’Reilly’s 2017 Design Salary and Tools Survey, some cool socks. Figure 12 shows the O’Reilly booth in the Sponsor Pavilion. This conference again attracted quite a diverse community of designers, representing many different design specialties. 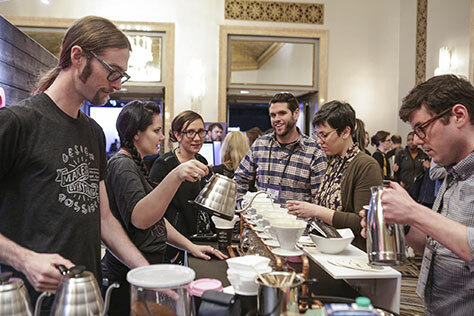 Creating a unified sense of community at such a large conference is challenging. There was a large contingent of San Francisco designers present who already belong to a somewhat cliquish community that may have felt closed to outsiders—designers from across the US and the world beyond. 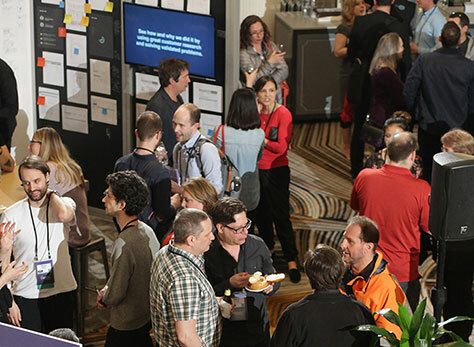 The many social events that O’Reilly organized probably helped attendees to meet new people—especially the speed networking sessions and BOF lunches. This conference again attracted quite a diverse community of designers, specializing in many different design disciplines. 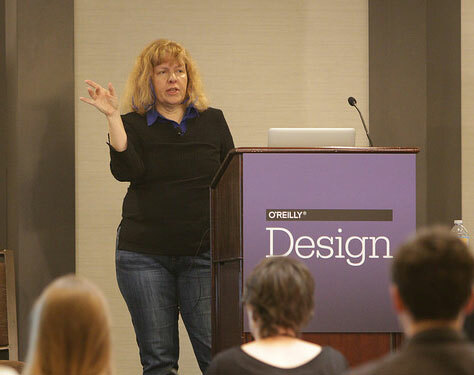 Speakers represented a broad spectrum of levels of professional competency—from the expertise of thought leaders, including UX leadership and some O’Reilly authors, to specialists at earlier stages in their career. 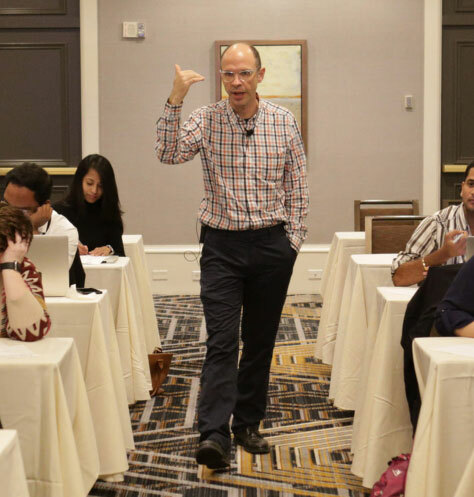 On Monday, March 20, six half-day tutorials—three in the morning and three in the afternoon—provided deep dives into quite diverse topics. Peter Merholz, shown in Figure 13, is VP of Design at Snagajob. A cofounder of Adaptive Path, he was Head of their Design Practice. More recently, was VP, Global Design, at Groupon and Senior Director of Design at Jawbone. 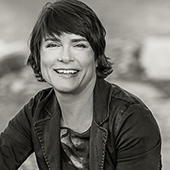 Kristin Skinner, in Figure 13, is Head of Design Management at Capital One and was formerly Managing Director at Adaptive Path. She is also the programmer and host of the LX Conference—formerly MX. Peter and Kristin are the coauthors of the O’Reilly book Org Design for Design Orgs: Building and Managing In-House Design Teams. This workshop was, as Peter described it, “low on activities and high on discourse.” “The nature of talking about Design organizations is one of leadership, and it tends to work better when we talk about it, hear your stories, hear your questions, and share with one another. … Let’s have a conversation,” suggested Peter. The Expanded Role of Design—We’ll go through the current state of design. Where are we in the industry right now. What are the trends that are happening? What are the different maturity models that we’re seeing. Peter and I have done a bunch of research around this. We’d love to hear your perspectives as well. 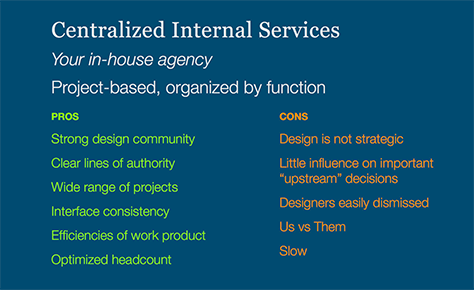 Organizational Models and Design Output—We’ll go through the organizational designs. The 5 Stages of Design Organizations—We’ll go through a lot of detail about the rationale—why we’re recommending that you have certain roles come on at certain times. Peter advised, “Don’t over think it. Just quickly sketch it out. 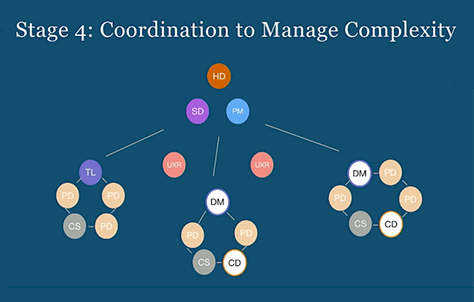 Focus on your Design team’s org chart. Then, if you have time, you can sketch in what the company looks like around it. 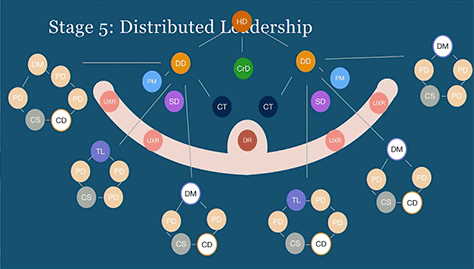 How it relates to the broader organization. 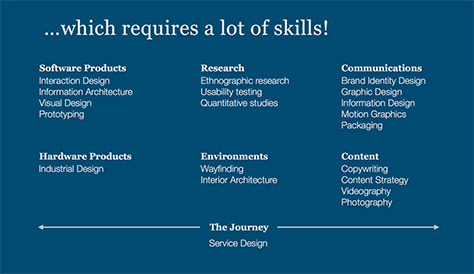 List out the roles within your Design team—what you call them.” At the conclusion of this exercise, several workshop participants described their Design organizations. 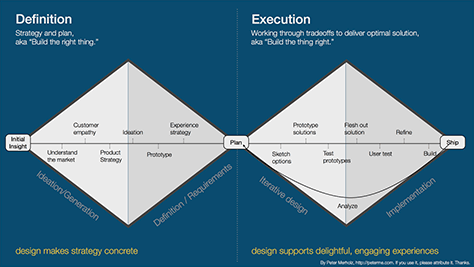 Design leading to innovation leading to the ability to generate new business value. To generate new revenue streams—new business value—innovation became the new black, and design kind of followed along on that wave, associated with innovation. Tim Brown, the CEO of IDEO, talked about the power of design for companies to realize this new value. While important, that would not be sufficient. Most [designers] are not actually doing this type of work. so that wouldn’t be a sufficient explanation for why companies are investing so much in design. The more active driver is that every company is now a tech company, because software is now essential for business. You need design in order to build good software. So we’re following on that wave as well. “As companies are making these big investments in Design, the concern that we have is: they’re not setting Design up to realize this full success because they’re trying to bring it into a structure that is not optimized for great design.” As Design leaders, “how do we create a space for a Design organization to thrive within these other contexts, so that investment does realize its full potential? “But more importantly, once you have all those skills, you need to figure out what’s the right mix. When do you bring them in? What are the right ratios? What are the teams actually working on? 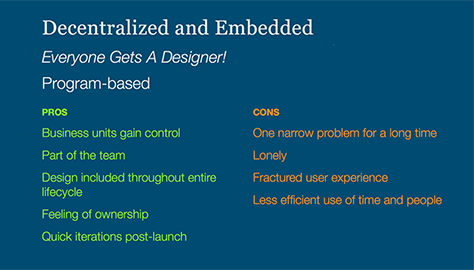 You really need to think about all the levels of scale the Design organization can address. There needs to be one autonomous, well-positioned, influential person thinking about the big picture. [You need] a team of folks who are focusing on the strategy. You need a team of designers who are focusing at the structure level—and then, the surface. You need folks who are focusing on these four core areas. 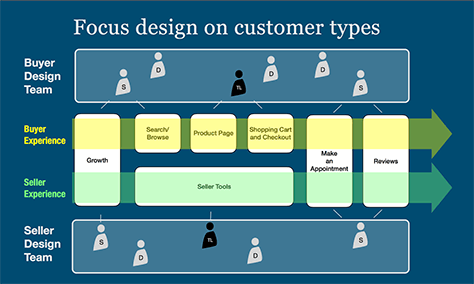 In the discussion that followed, participants considered the capabilities of their teams to deliver across the entire customer journey. Are they able to do this? “You might have multiple teams,” observed Peter. “The structure of each design team should be four to seven people. If you get much more than that, your design team is probably just too big. Once you get to eight, split into two teams of four. If you think about designer to developer ratios, anything from 1:4 to 1:8 to 1:20. IBM is a 1:8 company, so let’s use that. Seven designers can, thus, theoretically keep fifty-six engineers busy. If do you need multiple teams, the team still stays the same. 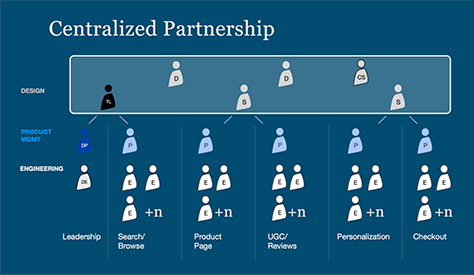 You’re just creating multiple teams to work across these larger efforts, and they might need to figure out ways to coordinate if you need to make sure this experience is coherent. “The argument isn’t that you can solve all problems with four to seven designers, it’s that four to seven is a good number for a design team that’s working together toward some [goal]. If it gets much bigger than that, the communication and coordination just within the design team starts getting out of hand. If you’ve got one leader and twelve designers that are all trying to work together, that just becomes unwieldy. “Customer Experience is funny because it’s not a well-defined field right now,” said Peter. 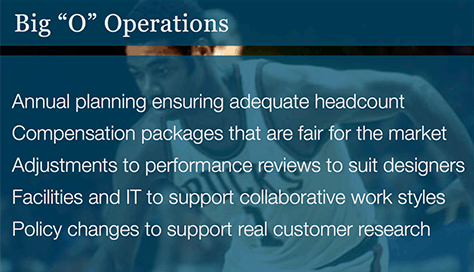 “Ultimately, I think we could all find ourselves working in a Customer Experience organization. We’re not there yet. Content Strategist—The focus of this specialist is voice, tone, content structure, and copywriting. Director of Research—“We’ve got five researchers, so now we need someone who can run that team. 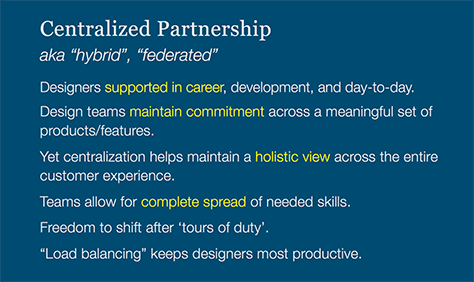 This is a small team within the Design team that sees a lot of what’s going on in the organization. 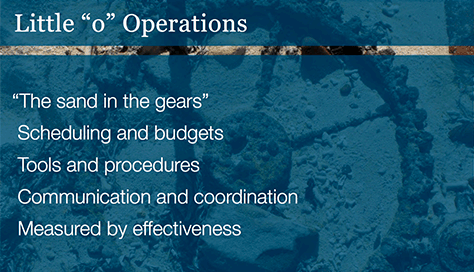 Before describing Stage 5, Kristin took what Peter called The Operations Detour, asking whether our teams suffer from the issues shown in Figure 24. 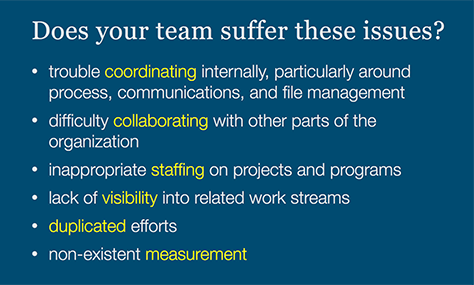 “Think about what your team is trying to address. You’re in growth mode. Are these symptoms happening? What are the practices you could put in place to try to address them? I found this workshop really valuable. Peter and Kristin are both highly skilled speakers and put together a beautiful slide deck that was just packed with useful information. The discussions they led were really stimulating as well. It was fascinating to hear about how other UX leaders are handling the challenges of our profession. In her workshop on voice user-interface (VUI) design, Ann Thymé-Gobbel posed the question: since a wireframe is visual, how do you wireframe for voice? The answer: write and record sample dialogs—an audio wireframe. With VUIs, specific changes in the wording and delivery of a voice prompt can massively affect how users interpret and respond to it. 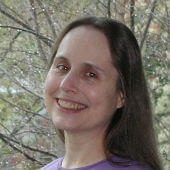 Ann Thymé-Gobbel’s background is in linguistics and cognitive science. At the beginning of the workshop, she polled the audience. Most of the people in the room identified as graphic user interface (GUI) or user interface (UI) designers and had some kind of Alexa or Google Home device. Ann began her workshop by describing some of the drawbacks of VUIs. She said she wishes she could talk to her Apple Watch. She told a story about once asking a voice-only interactive assistant: “What’s the current Giants score?” The assistant replied, “San Francisco Giants or New York Giants?” Ann said, “It didn’t know anything about me or the context of my question. What might have been a better way to reply? In what other ways might you ask the question to get the response you wanted? Consider the following questions: What is the premise? What do I know about the world? What do I know about this person? How might I make this conversation flow? Performance is amazing in comparison to just a few years ago. There is much more awareness of and access to devices that speak. They are everywhere—for example, in cars, toys, call centers, and medical devices. It takes two to have a conversation. 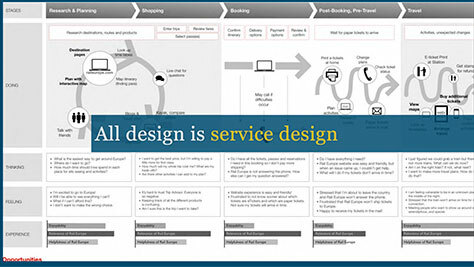 Therefore, VUI design assumes a human-to-computer, spoken conversation. Ann went on to tell us about the inexactness of language: “How many ways can you say yes—correct, sure, you bet. And what about how meaning changes based on intonation? For example: “Do you want to go to a party?” “Yeah!”—a definite yes. “Oh, yeah” means “Oh, I forgot.” “Yeah, sure” is sarcastic. To summarize the basic concepts and terminology, Ann cautioned us to remember that speech is linear and fleeting, so to lessen the cognitive load on the user, speech must have a narrow information stream. Generate sample dialogs—that is, VUI mocks. Create a VUI Design Spec. What does system need to fulfill that request? Taking the example of weather, Ann said, “There are many ways of asking: ‘How is the weather?’” For example, the system needs to know when and where you are. It is easy to make assumptions, but the system doesn’t know where you are—for example, you could be on Skype. Nor does the system know when you need the weather—now or tomorrow. Ann taught us, “Bits of information can be thought of as slots.” In the weather example, location and time are slots. Create a grid, with a column for each case. Plot out the user’s needs—to get weather for a location and time. Do we know the location? If not, how can we get it? Do we know what day? If not, how can we get it? Do we have enough information to finish? If yes, what is the resulting action? Minimize cognitive load through clarity and efficiency. Use terms users say naturally. List the most common commands first. Allow the user to control the information flow. Maximize accuracy and graceful recovery. Provide users with an easy way out—for example, by listing Exit as one of their options. Escalate error handling, but know when to stop. Use discourse markers, natural language, and personas. Discourse markers are words such as now, next, and alright. Say sure or okay. A little goes a long way. Use spoken language, not written style—for example, use contractions such as you’re versus you are. Follow rules of turn taking. Do use a preposition at the end of a sentence. Define a system persona. Which persona is right for your VUI? “The answer,” said Ann, “is that you’re conveying something to the listener. Think about what you want to convey. Don’t be creepy. Don’t know too much about the user.” Ann showed some creepy examples—hacked Billy Bass and skeleton Alexa. Use Mac dictation to generate text-to-speech (TTS). Use the built-in voices Tom or Samantha. “It is important that you record with two contrasting voices,” said Ann. Record your voice with QuickTime player. Set up playback for key commands, so you can respond to your flows quickly. The final step after creating a prototype would have been to interact with sample users as though we were the computer. While we didn’t really get to this step during the workshop, the techniques we learned seemed very useful. In Wizard of Oz testing, simulate the application logic and the speech recognition engine. To do this, participants are given task scenarios. Ann taught us that the designer has to be the wizard. Have a moderator observe and listen to the user. Ann cautioned: “Be sure to respond accurately and appropriately—for example, simulate barge-in.” The wizard plays pre-recorded prompts in response to whatever the participant says. The workshop went by very quickly. From workshop attendees’ level of engagement and the enthusiastic discussions afterward, I could tell that everyone thought it was a useful and worthwhile workshop. In 2017, the O’Reilly Design Conference was much improved over the previous year’s inaugural conference. In 2017, the O’Reilly Design Conference was much improved over the previous year’s inaugural conference. O’Reilly presented a great variety of excellent content and the conference’s production values were superb. While I’ve been looking forward to attending their next Design Conference, it seems O’Reilly may not be putting on a Design Conference in 2018. If you’re a designer, the next time O’Reilly puts on a Design Conference, I recommend that you attend it.